Roj Adar Mah Bahman, 1378 Yz. It is an honour and privilege to write a few words in memory of Ervad Eruchshah Edulji Karkaria, who passed away in Navsari on Roj Adar, Mah Bahman; Sunday, 24th June 2007 at the age of 91. Eruchshah was the last of the great stalwarts we had in our community who combined the rare gifts of wisdom, ritual knowledge, scholarly aptitude, self pride and implicit humility. Ordained a complete priest at a young age, Eruchshah probably performed more Yazashne and Vendidad ceremonies than a normal person would perform the Kusti. He had the most fantastic ability to recite prayers in such a pure and perfect way that a careful listener would be able to distinguish between the short “i” of one word and the long “i” of another, or the four different types of “e” present in our Avesta Manthras. He spent many years as a Prayer instructor at the Dadar Madressa and hundreds of priests who passed under his hands still remember him as an extremely hard task master who would not hesitate to severely beat up a student until he got the pronunciation of the Avesta correct. Despite the beatings and the hardships, they still had complete love, respect and devotion for him, ascribing their current successes only to his hard efforts. As a practicing Yaozdathregar, Eruchshah was instrumental in training several hundred priests in the intricacy of the higher Pav Mahel ceremonies, including current leading lights like Ervad Aspandiar Dadachanji, late Ervad Jehangirji Turel, Ervad Faredun Turel, Ervad Keki Ravji, Ervad Keki Panthaky and others. His grasp of ritual was so perfect that he even knew the subtle differences in rituals between the priests of different Panthaks, and would teach each priest based on his knowledge of the different traditions present in the Bhagaria, Karkaria, Sanjana, Godavara or Surti panths. He had deep knowledge of difficult ceremonies like the Nirangdin, Hamayasht, consecration of a Varasyaji, or a Dokhma. Several practicing priests would make it a point to visit him and get their doubts cleared before undertaking such ceremonies. Eruchshah was an encyclopaedia on the history of the priesthood, specially the Bhagaria (Navsari) panth which was founded in 1271 AD. The Bhagarias (so called because of their ancient agreement to share all the income amongst the partners) were divided into five main families, called ‘Pols’, each named after an illustrious leader. Each Pol would rotate the right to perform certain ceremonies in different months of the year so that all the five Pols and the various families (grouped by Surname) would get a chance to perform each different ceremony. Eruchshah could rattle of the rights of each family under every Pol for each day and month of the year! I still remember the first time I was introduced to him by another great son of Navsari, late Ervad Dosabhai Desai (Master Saheb), he immediately looked at me and said: “Hmmm… Hathiram – tame to Asa Faredun ni Pol na” (Hathiram – that means you are from the Asa Faredun Pol). He knew the complete history behind the various disputes between the Bhagaria and Sanjana Mobeds and would regale listeners (Priests only!) with the inside stories and quirks of some prominent priests. 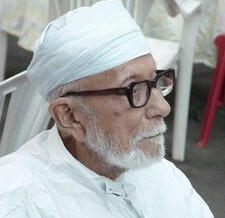 Eruchshah was a lifelong student of Ilm-e-Khshnoom, and had the great fortune of interacting for many years with Khshnoom stalwarts like Dr. Framroze Chiniwalla (who gave him many detailed explanations regarding rituals, as well as certain Avesta Nirangs), Jehangirji Chiniwalla (who passed on many astrological gems to him) and Dinshaw Masani. Eruchshah led a life of the highest Tarikat order, being extremely steadfast in following the most minute Tarikat rules, because he sincerely and rightly believed that a Mobed without Tarikats was like a fish out of water. Because of this insistence on Tarikats and his refusal to take any short cuts, Eruchshah found it extremely difficult to find priests who would agree to pair with him as the Joti-Rathwi for Pav Mahel ceremonies, a fact he used to bemoan in his last years. Eruchshah had weak eyesight, which grew progressively worse as his age advanced. Perhaps he knew through his knowledge of astrology that he would lose his eyesight in later years, and hence developed a voracious appetite for reading all the available Khshnoom literature. In lieu of his poor eyesight, Eruchshah was gifted with the most amazing memory I have ever seen. On several occasions when I visited him with queries on some Khshnoom topics or ritual questions, Eruchshah would never cease to amaze me by being able to quote the exact volume, page and paragraph number where my query would be answered. He would always embellish this book knowledge with the wisdom he had received from the Khshnoom masters referred to earlier and would present the answers in a manner that they would be immediately and for always engraved in my mind. Eruchshah was always frank in his opinion and would not hesitate to demolish the ego of certain so-called Khshnoom leaders by pointing out their mistakes either through phone calls or letters. When the Ustad Saheb Behramshah Nowroji Shroff Daremeher was established in 2001, and after I took over as Panthaky in 2003, Eruchshah wrote a letter to me, exhorting me to follow all the rules of prayer and ritual as explained by Ustad Saheb. In my reply to him I explained the various procedures we were following. He immediately wrote back commending me for that effort and laying down even further rules for the future. He also wrote a paragraph addressed to the Trustees of the Agiary, asking them to always support these efforts. That letter remains one of my most prized possessions. He was very eager to come to our Daremeher, specially during the Fasli Muktad days and witness himself the changed atmosphere present at that time. But time and his weak health prevented that from happening. He was one of my greatest supporters in keeping this tradition of Fasli Muktad started by Ustad Saheb nearly 90 years ago continue even today. He was extremely pleased when I started the Behram Baug Fasal Foundation to observe the Fasli festivals on the correct days and sent a very generous donation for the same. Eruchshah was a master of astrology, and many people flocked to him for his advise. He would make his daughter read out the basic horoscope with the planets in each of the 12 houses. Even without his eyesight, he would form a picture of that horoscope in his mind’s eye and would then start rattling off the various characteristics of that person as well as points for the future. He specifically called for my horoscope once and sat down with me and gave me some pointers. He seemed very amused when he found that in many parts my horoscope chart seemed to match with his own, and chuckled and told me: “now you’ll see how difficult it will be for you to follow the hard Tarikats of our religion”. Eruchshah had immense self pride – both as a Yaozdathregar priest of the highest calibre, and as a Khshnoomist. He steadfastly refuse to join the spectacle of hundreds of priests being presented large sums of money by lay persons for “their service to the religion”. He always used to say – ‘if it is service, then why should we accept this money?’ Despite several attempts to drag him to these “fairs” where Priests are paraded and given sums of money, Eruchshah firmly refused and was critical of those who did so, except in those cases where poverty was a concern. Always a stickler for protocol, Eruchshah was that rare person today who would always maintain his dignity and honour in public occasions and would always sit aside in a corner without a fuss until he was called on to the stage and asked to deliver a speech or a vote of thanks. It was for all these and many more reasons, that Eruchshah was perhaps the only person I have seen who radiated a “Noor” or luminescence on his face. Despite his advanced age and ill health, his skin was fair and without blemish, and his face shone an aura which immediately made one want to fall at his feet. All this and more we have now irretrievably lost. Now who shall we turn to for answers to our myriad questions? Who shall guide us in ritual and procedure? Where will we find the Nirangs and prayers to combat our frailties and weaknesses? Who will keep in check our boundless egos and self inflicted sense of importance? To whom shall we turn to show our children’s horoscopes? An era has ended and we are left orphaned by his passing. Eruchshah used to bemoan the poor quality of priests today, and would always wonder: ‘who will do my ceremonies?’ Nature always takes care of her own, and many of his senior students joined to fulfil that grave responsibility, in Navsari, as well as in Mumbai. Through these efforts, and through the intercession of the Abed Sahebs of Demavand who he so dearly loved and worshipped all his life, may his Ruvan come under the protection of Sarosh Yazad, and may it break free from the shackles of its physical body and arrive at the base of Chinvat to begin its journey to the onward realms. And may it continue to bless and guide us from there. It is indeed a tribute to Ervad Eruchshah Edulji Karkaria. May Dadar Ahura Mazda Bless his Pious Soul. Through this article, so many like me who have not known him atleast get to know now, what stalwarts and enlightened soul existed in our community. But it also makes me anxious thinking what will happen to our community in future, who will guide us and who shall save us from extinction. I had the good fortune of attending late Ervad Saheb Eruchshah’s Jashan on Roj Avan Mah Bahman at Mehella Patel Agyari. As an act of fate or Miracle whichever we can call it, as soon as the Jashan started the electric supply went off. There may have been a local breakdown or one in the vicinity, but as soon as the prayers got over the electric supply got restored. Since elctricity is one of the Khasters in nature which interfere with the other Khaster present in the precincts of the fire temple, and Eruchshah being such a pious soul that he was, nature made sure that his prayers were conducted in a way he would have preferred it to. Eruchshah Karkaria is my grand uncle. His wife and my grandmother were real sisters. However in all my 35 years, I never ever knew this aspect of his personality. Thank you for sharing it with all and amy his soul rest in peace. Amen. Its a sad thing that today’s zoroastrains do not have time or inclination to follow the foot steps of such great religious scholar. May his soul rest in eternal peace and guide us from Garothman Behest. This article was beautiful. what does Khshnoom mean. Is it a group of Zarthushtis or a group of books other than the Avesta? I live in Canada and am not too familiar with the terms and words used. But would love to learn. I would like to learn more about my religion so I can pass that on to my son but the resources are so far and apart and living in the west makes it even more difficult. I love reading the stories and different things put up in the Frashogard. Sometimes they make sense sometimes I am lost like today. THANK YOU for sharing, please do not stop. this was so cool! i enjoyed reading it. i so wish i could be a fraction of what he was! Plus learn more about my family’s priestly lineage. if anybody knows anything about the Bhandara Family lineage please enlighten me. Excellent article. God bless his soul. i was one of the lucky few behdins who had the privilege of getting answers to my difficulties… he always used to caution me ke dikra salaah tau magoch pun tene paalva khoobach mehnat me takat lagarvi parse teni taiiyari karich ke ? i would always humbly bow my head and promise him ke i shall try my utmost to follow our religion as guided by him. May why May …. His soul will definitely be resting in garothman behest. Thank You for enlightening us on such Noble Parsi Priestly Souls, May They Bless and Guide Us. You too Ervard Marazbanji continue to have the religious zeal to enlighten us the laity. Can you at your convenience enlighten us the names of such Priestly Souls whose names are recited in Jashan prayers and the reasons of remembering them so that we can respect them. Thank you. Ervard Marzbanji, Can you please inform us of Dasturji Rhushad Jamsheed Sohrab Kukadaruji’s mother’s name and any information you have on His Parents, relatives? Best Wishes, Keiky. Regret I do not have any information about his mother’s name. From his obituary notice in the Parsi Prakash of 1900, it seems that he had two sons – Seth Faramji Jamshedji Kuka (Master) and Er. Sorabji Jamshedji Kukadaru. No other biographical information is available. I never knew Dasturji Kukadaru was married and had 2 sons; May their Souls Rest in Peace along with HIS Family.